A tremor or loss of strength in the hand may be a single event brought on by something as simple as aging or numbness from a temporary lack of blood supply. 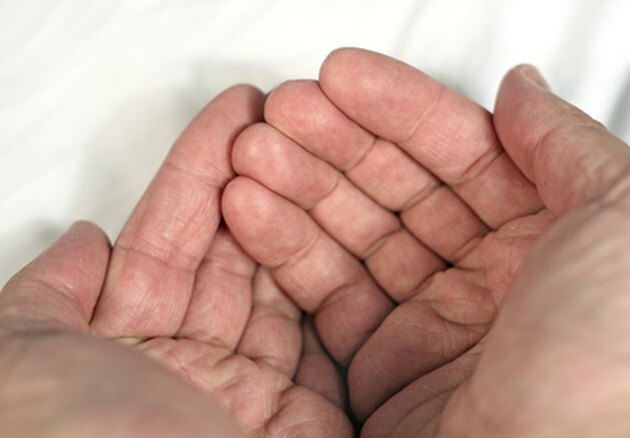 People who commonly experience hand tremors or who have an inability to grip objects should undergo an evaluation from a physician to make rule out a more serious underlying condition. Osteoarthritis, also known as degenerative joint disease, is a common form of arthritis that occurs over time as the cartilage in the joints wears down. Osteoarthritis most commonly occurs due to the normal aging process but may also be caused by joint injuries, heredity or obesity. Symptoms of osteoarthritis include pain in the affected joints, tenderness, stiffness, loss of flexibility and weakness, grating sensation and bone spurs. When osteoarthritis affects the hands, it may cause a loss of grip strength and very mild tremors. Treatment for osteoarthritis most commonly includes NSAID medications such as aspirin or ibuprofen, corticosteroid injections and physical therapy. In severe cases of osteoarthritis, physicians may consider surgical options. Parkinson's disease is a progressive disorder affecting the nervous system. Parkinson's disease affects movement and develops gradually, often starting with a small tremor in one hand. While the exact cause of Parkinson's disease is unknown, many chemicals in the brain seem to factor into the disease. Patients with Parkinson's show a lack of the chemical messengers dopamine and norepinephrine in the brain and often have the presence of abnormal proteins called Lewy bodies, according to the MayoClinic.com. Symptoms of Parkinson's disease include tremor, weakness, decreased ability to create voluntary movements, rigid muscles, impaired posture and balance, speech changes and, in later stages, dementia. There is no cure for Parkinson's disease but many medications can treat the symptoms and help promote greater independence. Multiple sclerosis is an autoimmune disease in which the body's immune system eats away at the protective covering over the nerves. This causes interference between the brain and the rest of the body. Over time, this results in a permanent deterioration of the nerves themselves. Symptoms of multiple sclerosis include numbness and weakness in one or more limbs commonly occurring on one side of the body, partial or complete vision loss, tingling or pain in the limbs, electric-shock sensations, tremors, lack of coordination, fatigue and dizziness. There is no cure for multiple sclerosis. Treatment mainly focuses on controlling the body's immune response and symptom management. Medications include corticosteroids to control inflammation and interferons to help slow the progression of multiple sclerosis. Physicians may also use physical therapy to help patients maintain independence for as long as possible. A stroke occurs when the blood supply to the brain is reduced or impaired causing a lack of oxygen and nutrients to the tissues. Brain cells begin to die within a few minutes. A stroke is a medical emergency and immediate attention is necessary to prevent long-term complications and possibly death. Symptoms of a stroke include trouble walking, paralysis, numbness or weakness on one side of the body, trouble speaking, headaches, tremors and trouble with vision. Treatment for a stroke includes medications to reduce any clots occluding the blood supply as well as therapeutic interventions after the stroke to combat muscle weakness, speech impairments and bowel functioning.